Kudos to Mr. Young (old link stopped working) for managing to come up with an original idea for a fantasy novel. I cannot remember ever having seen something like Gloomwood described. Let’s see if I can describe it to you. In Gloomwood the head honcho is The Grim Reaper – yes the skeleton with a scythe. For some reason the Grim Reaper created Gloomwood for dead people (obviously) but also for dead ideas (you will see Father Christmas near to the beginning) and dead dreams. Gods that people have stopped believing in also end up in Gloomwood. OK. So we have a city for the dead. That is exactly what Gloomwood is – a thriving (maybe not so much) place where the dead (of a certain kind) end up and live their deaths. There is crime, good deeds, bad deeds, bureaucracy, spies. One of the latest additions to the community is Augustan Blunt. Blunt is his name and blunt is what he is. The leaders of the city decided to expedite his death so he could investigate why/who/how the head of the Grim Reaper was stolen. For that reason they have made him chief investigator. Being an ex-cop and a detective while alive makes him qualified for the job. That and being new and unprejudiced and neutral. 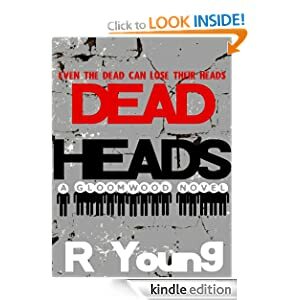 The fun thing about reading Dead Heads is that I read along thinking of the novel as a plain mystery. Then bam, something really weird happens – like decapitations without splatter. I like their library and their “internet”. In fact, I think Ross Young is onto something with real potential here. He writes well and engages me as a reader. The writing needed a bit of tidying up. Punctuation (periods) were missing and there were odd little paragraph breaks. That was about it I think. You are welcome and it was kindle.